At Collective2, we are always keen to work with companies and individuals in the trading, investing, and financial services space to find ways to expand the reach of our technology, platform, and services. Here are a few offerings and programs designed specifically for Broker-Dealers, CTAs, FCMs, and independent system developers with existing customer bases. If you are broker, CTA, or system developer, you can privately-brand C2 for your own use. 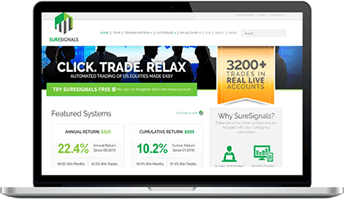 SureSignals.com uses Collective2 technology, but has customized the look-and-fell of their site. They offer their own trading strategies for one all-inclusive monthly price, which includes the ability to Auto Trade the strategies at a compatible broker. You like C2. Maybe you even like a few trading strategies that you’ve found on the platform. We encourage you to tell other people about good C2 strategies. We’ll give you a personalized link that leads back to a specific strategy. Share your link about your favorite social media property like Facebook, Twitter, or LinkedIn. When new customers follow your personal link and then subscribe to the specific trading strategy, you’ll earn 10% of the subscriber fees for that strategy for the first year…. Not ready to build a completely new non-C2 web site? Don’t currently have 50 subscribers to your own web site? Learn about our Affiliate Program. It’s free to get started, and you earn 1/3 of our fees when you bring new customers to your affiliate site…. Offer to your clients our “evergreen” library of trading strategies. No more running strategies on TradeStation, and then quickly typing orders into client accounts! Let your clients trade any C2 strategy in their self-directed broker accounts… it happens automatically. Remove references to all other brokers from your private site. Optional Re-brand Collective2-provided strategies with your own brand names. Hide all other brokers from your private-branded platform. Optional: Allow your RIAs, CTAs, and Introducers to create their own “private sites” while locking down their customization options to ensure they meet your compliance standards. Completely customize the look and feel of your private-brand web site. We support multiple business models: per-strategy subscription pricing or “all-you-can-eat monthly” membership models. Let the C2 Platform handle the technology of keeping an updated track record, and AutoTrading. Appropriate for web sites with 50 or more subscribers. Sell to retail investors monthly “subscriptions” to your trading strategies. Traders follow in self-directed brokerage accounts using C2 AutoTrade technology. This activity can be separated from your other CTA activities. Collective2 is an NFA member. (Optional) Use different branding so that strategies you offer on your private-branded web site do not interfere with your other CTA activity. (Optional) Choose whether to keep your strategies exclusive to your private web site, or to also offer them on the main Collective2.com web site, for additional revenue.